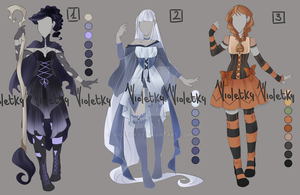 So I'm trying something old and making adoptable sets again, but I'm trying them in groups of 7. :> My first set is based on seven different Fairy Tales. 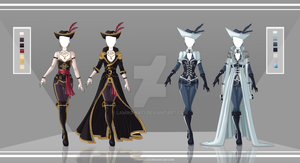 These are my own interpretations and I know everyone might have their own ideas of what these dresses might have looked like, which is okay. This took me about 3 weeks to design, color, and detail. I hope you all enjoy them! Please comment or note to buy! Note: The file is a much higher res than the preview on DA! 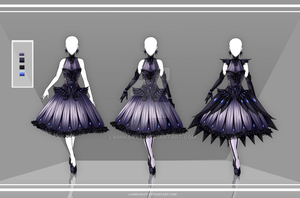 If interested in buying please don't be shy to ask for the full resolution of the dress you're purchasing! interesting design to have beauty and the beast be a red design instead of the traditional yellow, I quiet like it! Could I please have #1 :3? Yes you may! Do you need it on hold? The Cinderella, The Snow Queen, and The Beauty and the Beast dresses are are gorgeous. Very wonderful job with these! These are all beautiful but I especially like the Rapunzel and the little red riding hood. How do you buy??? Because I see one I might want to buy if it's still available. Also are you sells the made dress or the design? You simply state the number dress you want and then send money over paypal. I'm just selling the design, no physical version of the dress. may I also get the Snow Queen too? Nooooo I was too slow for the red riding hood one! Well these are all really good! Nice to see you starting off the new year right! There's always another time. c: Thank you very much! So beautiful . I have no words for the beauty and detail on each dress. Wonderful and beautiful job with the dresses! Are you making and selling the dresses? Or prints of the design/images? Ah, ok! Are you selling them to whomever wants to purchase them, or just one customer per design? Good job, by the way. They're amazing! It's one of my favorites! Thanks so much! I'm in so much love with that Cinderella dress, but can't afford it. Huge congrats to who ever gets that one. I've had a couple people so far ask about it, but I wasn't sure if they were offering or not. Once I know for sure whether they were serious offers or not could I let you know?